Saar has a state-of-the-art infrastructure that helps us in carrying out various processes right from Paddy to Finished process stage. Paddy is cleaned, dehusked, milled, polished, sortexed and finally packed in modern rice processing machinery which ensures complete food safety as well as ensures that the products comply with International standards. 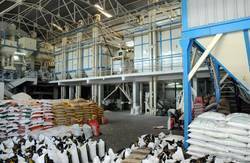 The rice is also graded and packed according to the variety and quality of the same. Our professional team consist of Technocrats, Research and Development team and other Skilled and Unskilled Workforce. The Research and Development team works relentlessly to improve the quality and variety of the Basmati Rice. We work as a cohesive team with the mission and dedication to achieve continued growth, success and prominence in world markets.